OK… a catchy title like beware of Florida snakes can be an attention grabber. After, most common fears of snakes derives from fear of venomous snakes, or the types of snakes that can inject a potentially lethal venom with their bite. Often the term poisonous snakes is used interchangeable with the term venomous snakes. However, poisonous snakes refers to those snakes that are dangerous when consumed, a completely different category. People can consume rattlesnake meat, for example, and not fall ill. On the other hand, being bit by a rattlesnake could cause serious health problems. Approximately one-quarter the world’s snake species, or 750 snakes, fit into the venomous snake category. Depending on taxonomic preferences, they might belong to a handful of snake families. Florida hosts six venemous snake species and they fit into two of the most common families. The Coral Snake (Micrurus fulvius) fits into the family Elapidae, whose members are well known around the world with names such as cobras, coral snakes, mambas, and taipans. The picture shows a Coral snake. The presence of other Florida snakes with red on their bodies such as the Scarlet Kingsnake can often cause identification confusion. One initial identification clue is face color. 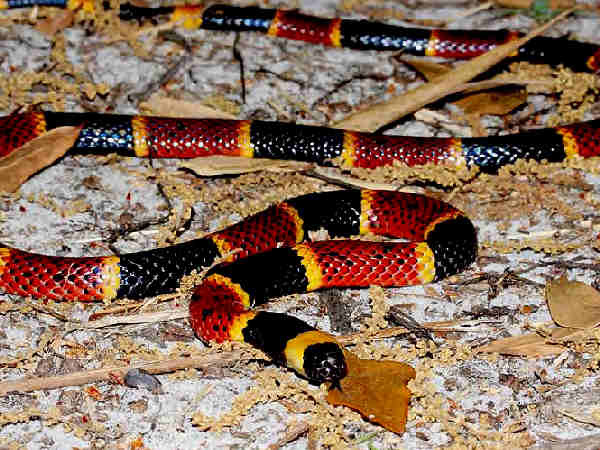 Coral snakes have a black face and the Scarlet Kingsnake has a red face. Pit vipers account for five of the species. 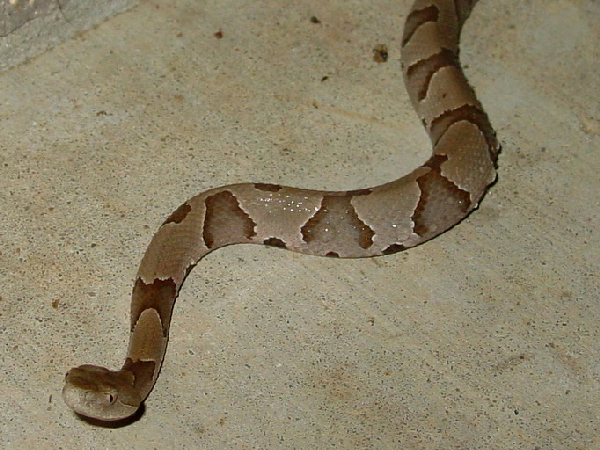 Their common names are familiar to most people, copperheads, cottonmouths and rattlesnakes. The name Crotalidae refers to the presence of a sensory pit in the face, below the nostril. Pit vipers inhabit northern temperate regions of Asia, Europe and the Americas. However the two native rattlesnakes (crotalus and sistrurus), are the only pit vipers with tail rattles. The picture shows a copperhead snake. The presence of a rattle helps identify any of the rattlesnake species. Cottonmouths can be a bit difficult to identify because they are often found in water areas and can look similar to many of the native water snakes. While up to eight thousand venomous snake bites are reported on a yearly basis, quick thinking by the victim or a nearby person, along with proper medical care means that the vast majority of venomous snake bite victims live to tell their stories. Recent statistics suggest that about one dozen snakebite victims per year do not live to tell their story. In order to stay in the majority, the Center for Disease Control (CDC) suggests following a step process for anyone suspected of being bitten by a venomous snake. First, known the symptoms of a poisonous snake bite. Second, seek medical attention as soon as possible (dial 911 or call local Emergency Medical Services. Try to remember the color and shape of the snake, which can help with treatment of the snake bite. Keep still and calm. This can slow down the spread of venom. (If you are at work), inform your supervisor. Apply first aid if you cannot get to the hospital right away. Lay or sit down with the bite below the level of the heart. Cover the bite with a clean, dry dressing.